One of the best ways to learn how to play blackjack is to access the many free games that can be found online. With a blackjack guide and some tutorials offered at a gaming site, you can learn how to bet on blackjack and increase your chances of winning. The key to knowing how to play blackjack is in understanding the game rules. These rules will vary based on what version of the game is being played. At many online casinos, you can learn how to play blackjack like a pro and since you are playing free games, there is no financial risk. Once you have mastered the game rules and have picked up some strategies, you can start wagering for the chance to collect real money payouts. Learning how to play blackjack will take some time and patience, but this will all pay off in the long run. Blackjack is featured at just about every operating casino, so you will have many opportunities to engage in this thrilling game and have some stellar chances to collect returns on wagers. Once you have taken some time to preview the different games offered, you will be ready to hit the tables. At online casinos, you will find many variations of the game being offered, including live dealer versions, so there are endless ways to enjoy a thrilling and rewarding blackjack experience. The rules of blackjack are not overly difficult to understand, but they will vary with each variation that is played. 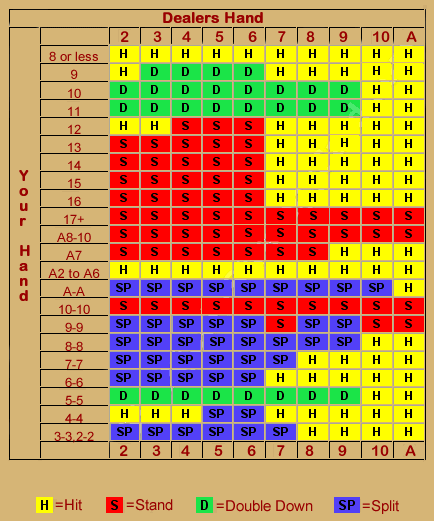 The best thing you can do is make use of blackjack rules charts, which can be found online. With these, you can learn the standard blackjack rules and apply them to most variations of the game. Many casino blackjack rules are the same and you will find that once you have an understanding of simple blackjack rules, you can play just about any version that is featured. The rules of blackjack are relatively simple. The overall goal of the game is to create a hand that has a value that beats the dealer's hand. You will want to come as close to 21 without going over that amount. The game will start by choosing a bet amount. You will then be dealt two cards and the dealer will receive two cards. You will have the option to hit, stand, double down, or take insurance based on what cards you are holding. The game is often played with multiple decks using the standard 52 cards from each deck. Before the deal begins, you will have to place your wager based on the table limits. One face up card will be dealt to everyone at the table, including the dealer. A second face-up card is dealt to all players and one that is face down to the dealer. If you get a natural blackjack with these two cards, which would be an Ace and any ten valued card, you will win immediately. When determining whether to stand, hit, double, or make use of any other option, you will assess your hand value. An Ace will be worth either 1 or 11 and 10 through King are all valued at 10. The rest of the cards maintain their face value. After all cards have been dealt, you will decide how to play the hand. The dealer will also have rules in place. With most variations, they will stand with a hand value of 17 or more. If the hand is 16, the dealer is required to take a card until the hand value is over 17 or the and is a bust by going over the value of 21. After the dealer plays the hand, all player hands are compared and those that have a higher value than the dealer will win. All other hands will be lost and chips will be collected. By mastering blackjack basic strategy, you will know when to make important decisions such as splitting, doubling down, or even surrendering. All of these options are not available with every variation of the game, which is why you need to learn the official blackjack rules that are in play for that particular game title. While the rules may at first seem complicated, after some practice you will be able to memorize the rules of blackjack and be able to play any variations that are presented at an online casino site. If you are looking for the best way to win at blackjack, you will have to take time to master the rules of different game variations and to learn basic blackjack tips. There are many resources available, from online blackjack charts to interacting with other players and learning from those with experience. You may wonder if it is possible to consistently win at blackjack, and that answer will all depend on how well you play and whether luck is on your side. The keys to winning blackjack lie in the use of strategy. The most successful players will always follow a basic strategy and will then use their own tips and strategies to increase the chances of winning. While there is never a guarantee, following basic strategy is your best way to learn how to win at blackjack without counting cards. As you gain more experience, you will develop your own style of playing and betting at the tables. Over time, you can enhance techniques and have some amazing chances at beating the house and mastering the best way to win at blackjack without depleting your casino bankroll.